ATTLEBORO, Mass. 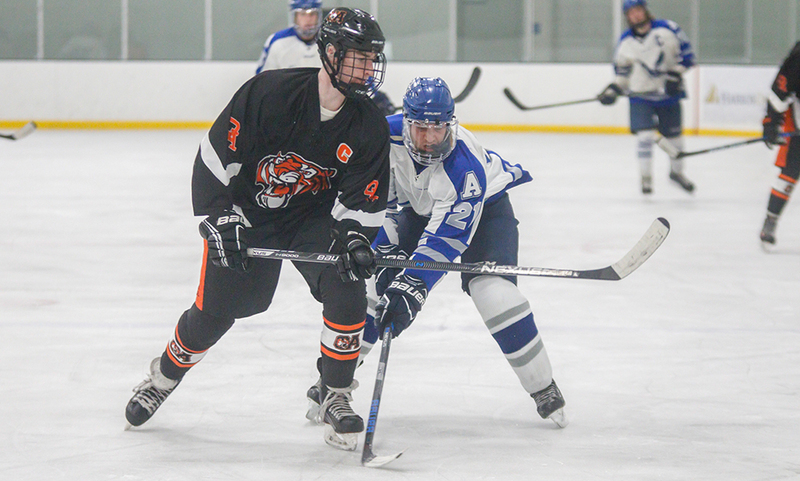 – Both Oliver Ames and Attleboro skated to wins on Wednesday night, so both were facing the tough task of such a quick turnaround with a matinee matchup on Thursday at the New England Sports Village. But by the way the Tigers came out, you’d never know they had just been on the ice the night before. Oliver Ames scored less than a minute into the game, added a second goal in the final minute of the opening period, and then scored three more in the final period, picking up a 5-1 win over the Bombardiers. “We wanted to get the points sooner than later,” said OA head coach Sean Bertoni. “We came out strong in the first. I wasn’t happy with how we came out in the second, it wasn’t our best period. I think the penalties kind of threw us off a little bit. But we came out strong again in the third, especially right away. The Tigers move within one point of qualifying for the state tournament with four games left. Attleboro is already in the state tournament via the Sullivan Rule after their big win over Weston on Wednesday. The visitor’s offense came from its defense in the first period. Senior defenseman Michael Nikiciuk stepped into a shot atop the right circle and the puck found its way through traffic and into the back fo the net with 14:11 left in the period. Attleboro’s best chance of the period came with 3:30 to go when senior Jake Parker had a chance at a partial breakaway but good back pressure from OA’s Matthew McCormack didn’t allow Parker to get a shot off on target. While it looked like the Tigers would take a 1-0 lead into the break, the offense came back to life. LeBlanc, who was credited with an assist on the opener, had a pair of shots saved and Ross Carroll saw his rebound bid go just wide of Attleboro goalie Evan Andrews (29 saves). In the same offensive cycle, Rory Madden deflected the puck to the center of the ice, between the circles, and Nikiciuk stepped up once again from the blue line, batting a high shot through traffic and into the net for a 2-0 lead. Attleboro had its best chances in the second period thanks to a pair of power play opportunities. OA was whistled for a cross check at 11:12 and the Bombardiers had a couple of chances over the next two minutes. Big Blue’s best chance came at the tail end of the man advantage when Sam Flynn had his low shot redirected in front hit the post. Before that, Attleboro had three good chances denied by blocks. The Bombardiers went on the man advantage a minute later. Junior Cam Littig came flying down the ice and shuffled a pass to sophomore Ryan Morry on a two-on-one bid but OA sophomore goalie Owen Connor made a nice push from right to left and make the save with the blocker. Oliver Ames cashed on the momentum it gained with the penalty kill in the third period. Attleboro took a penalty just 11 seconds into the third, and though it was able to kill off the man-advantage, OA kept the pressure up and converted shortly after. With the puck still in the offensive end Madden dropped a pass back to Hunter Costello. Costello got a piece of it, causing a scrum in front. The puck popped free back to Madden, who whipped a low shot while turning to goal to make it 3-0. After killing another cross check penalty, Oliver Ames junior Colin Bourne took a pass from Madden, raced down the right side fo the ice and found the back of the net with a wrist shot. OA added a fifth goal in the final minutes when Madden got his second goal of the game, and fourth point, stuffing one in from behind the net. Attleboro’s lone goal came in the final seconds when Littig batted in a one-timer on nice pass from Flynn. Oliver Ames boys hockey (5-4 Hockomock, 10-7-0 overall) will try to earn the point it needs for the state tournament when it takes on Brockton on Saturday at 6:00. Attleboro (1-7-1, 7-9-1) returns to action on Saturday with a trip to Martha’s Vineyard to take on Old Rochester at 5:00.